A fun thematic game based in South America. The goal is to achieve the most victory points by exploring the ancient Mayan city of Tikal. 1. Draw a terrain tile and place it on the board. Players must be able to travel to the new hex from at least one face. 2. 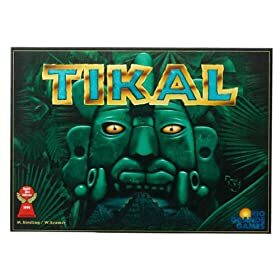 Use up to ten action points to explore Tikal. You can establish a base camp, add more expedition members to your base camps, move expedition members, dig for treasure or temple levels, swap treasures to make sets, or guard your temple finds. The actions cost between one and five action points.When a player draws a volcano tile, everyone immediately scores. You earn points by controlling a temple (which has a value from one to six points), and owning treasure (one type equals one point, but you score six points for a set of three). Once a player places the last hex on the board, you have one final scoring round. Highest total wins. The game changes every time, since you generate the board dynamically. It also offers an auction variant where players use their victory points to bid on the terrain tiles instead of using what they randomly select, thus skewing the emphasis away from luck and towards skill. The downside to the game is that some players may take a while to spend their ten action points, as they can’t (or don’t) plan for their turn while their neighbor completes their turns. This can slow the game down somewhat. While I wouldn’t play the Tikal game every week, I do find it enjoyable on a semi-regular basis. It’s simple to learn and never the same twice.